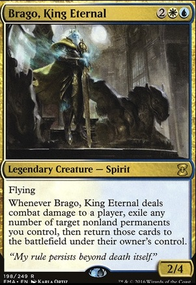 How does the Brago, King Eternal blink effect work? When an opponent declares attackers and taps his creatures, can I Cloudshift + Sunblast Angel to destroy them before damage happens? When Sunblast Angel enters the battlefield, destroy all tapped creatures. Sunblast Angel is a situational card I like quite a lot. Treasury Thrull is quite high on mana and I might consider cutting it. As for the win condition thing, it's not really a win condition for me to have Torment of Hailfire but it's quite good. I mostly like to just put a touch of Avacynn with Shroud/Hexproof + other creatures so I can have a good board that's hard to kill while maintaining Merciless Executioner , Fleshbag Marauder and the Plaguecrafter I will add to my deck. Also, as I am quite new, I would like to ask what you mean by ETB and LTB effects? Not sure what those are. I've been considering Dictate of Erebos and may simply add it. 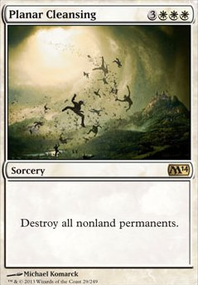 As of yet, that sounds like a cut for Treasury Thrull, all 3 Myr and adding 4 lands, most likely will add 1 Plains and 4 Swamps. Forgot to say, I also removed High Priest of Penance as it was there for basically no reason. That one will add a Plains as well. idiot_taco you're welcome! :) I would cut the myrs in the first place since they have summoning sickness and are vulnerable to removal. 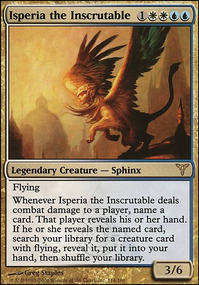 Furthermore cards like Treasury Thrull or Sunblast Angel seem a bit situational. In the first place i would try to figure out how you would like to win apart from Torment of Hailfire (I can't tell for sure atm). With Ahtreos i would try a strategy that goes with strong etb- or ltb-effects and maybe pair it with aristocrats like Blood Artist to support the lifeloss from your commander. Also Dictate of Erebos might be a good addition if you run edict effects like merciless executioner. You could enhance this path with Plaguecrafter as well :) Hope this helps a bit! Sunblast Angel and Stonehorn Dignitary for a bit of combat control. Ah, what a rookie mistake! That's some good advice, thanks. I don't want to drop too much cash on this, but Gideon's Avenger and Sunblast Angel from your deck look like they'd be useful. 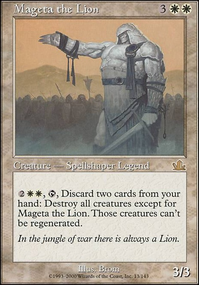 Deathbringer Liege may work if I chuck in a couple of cheap black instants to support it, like Midnight Charm and Rathi Trapper , or simply Terror . It might be wise to ditch the 2x Frost Titan for the sake of the mana curve and to accommodate black / white creatures instead. I guess if I wanted to make something based on the Scythe then Deathtouch and forced blocking would be the way to go, and/or creatures that have abilities to deal damage like Jagged-Scar Archers , Femeref Archers , or Tahngarth, Talruum Hero (or any number of red creatures). Totally different deck, but it's something to work on. Mark for Death I think is a hidden gem for combat deck including red. 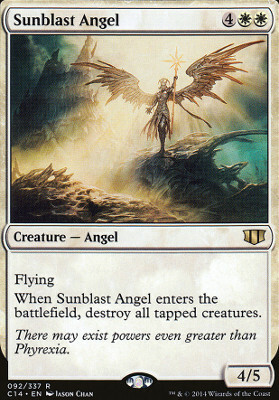 As for Angel's, you have Subjugator Angel & Sunblast Angel that work well together, esp if you include a blink package. Angel of Condemnation can be used both offensively and defensively. 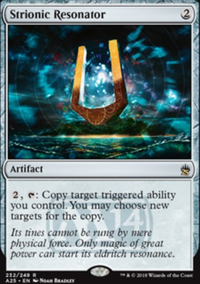 Angel of Finality for gy hate, Brisella for shiggles, Angelic Arbiter to slow things down.